Thor is the acme of virility, with his luxuriant red beard, flowing hair, and hearty enjoyment of food and drink. 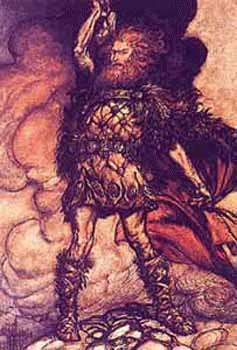 In addition to his primary role as patron of warriors, Thor, like Freyr, was called upon as a fertility god. The 11th century Christian missionary Adam of Bremen, on noting the great temple of the gods in Uppsala, Sweden, wrote, "Thor, they say, presides over the air, he governs the thunder and lightening, the winds and rains, fair weather and crops...If plague and famine threaten, a libation is poured to the idol Thor." Thor's equipage was endowed with extraordinary magic: He owned a belt which when strapped on, doubled his strength. He had huge gloves with which he could lift and crush boulders. He travelled through the skies in a cart pulled by two goats - themselves acknowledged symbols of animal vitality. Most powerful and fabled of his tools was Mj llnir, his war hammer. Like all of the finest possessions of the Gods, Mj llnir was forged by dwarfs, supernatural beings who dwelt in the depths and were thus imbued with the direct energies of iron, gold, silver, and gem stones. Mj llnir would hit any target at which it was aimed, and unfailingly return to Thor's mighty hand. This hammer, a prototype of the Viking throwing weapon skeggox, was adept not only at offence but defence. Hammer shaped amulets were worn for protection, and placed around a bride's neck on her bridal day. As it was Thor who battled the World Serpent, often these amulets bear a serpent or dragon-like decoration commemorating this contest. Another example of Mj llnir's sacred powers is shown in the resurrection of Thor's goats. These goats not only transported the god, but provided dinner: One night Thor stopped at a farmhouse and killed and roasted his goats for his own and his human hosts' supper. Disobeying the god's orders, the farmer's son broke one of the goat's leg bones to reach the succulent marrow within. When the meal was over, Thor collected all the bones, lay them upon the goatskins, and raised his hammer Mj llnir over them. At once the goats re-formed, and stood live before the astonished humans. Alas, one goat was lame as a result of the broken marrow-bone, but Thor stayed his anger and as recompense took son and daughter away with him. Thor fought many celebrated battles, especially against the god's greatest foes, the giants, but he is most remembered for his struggle with the World Serpent. Standing rune- and picture stones from all over Scandinavia, but particularly Sweden and Gotland, depict the hammer-wielder in a deadly put seemingly unresolved embrace with the sinuous monster. Possibly this conflict was not meant to be resolved, as the World Serpent performed a vital service in encircling the entire Earth and by biting its own tail to hold it together. In the words of scholar Gro Steinsland, ..."This myth demonstrates that people in the Viking Age realised the limitations of brute force; at the same time it cunningly expresses the perception that the forces of chaos are indispensable elements in the greater cosmos." ODIN (Woden to the Anglo-Saxons) is a god of the mysterious realms of wisdom, cunning, sorcery, and death. 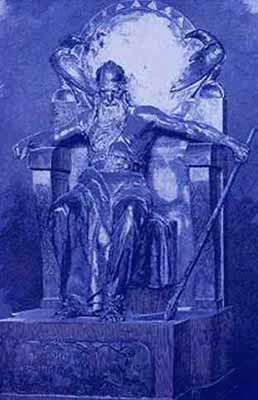 Subtle, aristocratic, and at times inexplicable, Odin is the literal father of important gods, such as Thor, and All-Father to the whole of creation, divine and human. Amongst his gifts to us, his children, was the greatest of all: the gift of writing.To accomplish this Odin hung himself upside down upon the World Tree, the gigantic ash Yggdrasil ( a compound meaning "terrible horse"). After nine days of fasting and agony, in which "he made of himself a sacrifice to himself", he "fell screaming" from the tree, having had revealed to him in a flash of insight the secret of the runes. Their initial manifestation took the form of eighteen powerful charms for protection, increase, success in battle and love-making, healing, and mastery over natural causes. This story illustrates an important dynamic of the Northern pantheon, which did not allow for omnipotence: even Odin must pay his due. At Mimir's well, which lay deep under the roots of Yggdrasil, the World Tree, the god had earlier chosen to undergo an important forfeit. Odin paid with one eye for a single drink of the enchanted water. His mouthful granted him wisdom and fore-sight. His quest for knowledge was never-ending. Upon his shoulders perched two ravens, Hugin ("Thought"), and Munin ("Memory"). These circled the Earth each day, seeing all, and then at night reported to Odin what they had learnt. He cherished them both, but particularly Munin, which seems to underscore the importance he placed on rune writing, record keeping, and honouring the heroic deeds of the past. 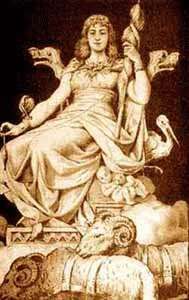 There is another bird associated with Odin, the eagle. The god often transformed himself into this canny raptor, both to view the workings of the world and to intervene when an avian form was better suited to his ends. Odin's fabulous grey horse Sleipnir was like no other. This is the eight-legged horse depicted so beautifully on the painted stones of Gotland, a now-Swedish island in the Baltic. Sleipnir was the offspring of a giant's magical stallion and the "trickster" god, Loki, who disguised himself as an alluring mare to distract the stallion from the task of building a wall around Asgard, home of the Gods. If the wall had been completed by a certain date, Freyja, the goddess of beauty, war and sexuality would have been forfeit to the giant as payment for his labours. (The gods also stood to lose the Sun and the Moon, but did not seem particularly concerned about their impending loss!) Loki was successful, but vanished for a few seasons as he had to bear the fruit of his trickery. He returned to Odin leading his equine offspring, which he presented as a gift. With his eight legs, Sleipnir could run twice as fast as ordinary steeds, and it is he who carries the valiant dead from the battle field to Valhalla. It's not nice to swear! even if you use a !